Our customers tell us that our WINDOW BOXES keep their gloves, manuals, charts, and hard hats safely tucked out of harms way while driving. 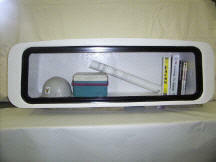 The fiberglass construction of this rear window unit uniquely prevents our window box from being thermally conductive like metal reducing inner sweating and assuring a long and corrosion free life. Call for information and pricing. The BR-UBB underbody bus box is ideal for all types of school bus chassis. The lightweight fiberglass construction allows for more cargo carrying capacity. The double-skinned doors make for a very lightweight, sturdy door. One door and two door box available and three door box coming soon! Call for information and pricing. The Built Right Fire Extinguisher Box is constructed out of aluminum to make it lightweight and corrosion resistant. 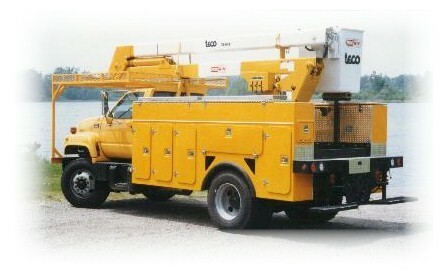 It is designed to mount on any utility box or half-ton top rail. It is powder coated red inside and out. It is designed to accept the hydro approved C-TGE-10E fire extinguisher. Call for information and pricing. This truck body has one piece molded construction for durability and strength, rubber seals mounted on body opening, increased laminate thickness at attachment points and aluminum drip lip and flood coated interior for easy cleaning. Call for information and pricing. The revolutionary tapered design of the BR-98-TB gives greater storage space while improving wind resistance. The boxes have been extended by two inches for increased load capacity. A steel headboard is provided to connect the two side boxes and a steel foot is provided to support the units at the rear of truck. Call for information and pricing.